Gorilla Wood Glue is an all-purpose wood glue suitable for a variety of hardwood, softwood, and composite wood (such as medium density fiberboard, a.k.a. MDF) projects. While considered a white woodworking glue (in that it has an off white color when in the bottle), Gorilla Wood Glue dries to a more natural color than many other woodworking types of glue. While Gorilla makes a variety of adhesives (such as Gorilla Glue Epoxy), this wood glue is a little less specialized and a bit more for everyday woodworking and carpentry use than some of their other formulations. As such, this Gorilla Wood Glue is easily sand-able (with a hand sanding or with the use of a palm sander or random orbit sander. Gorilla Wood Glue passes ANSI/HVPA Type II specification for water resistance and has no added dyes in the event that the glue is visible in your application. The glue is paintable and resistant to mildew and solvents and is even FDA approved for indirect food contact. As such, it is ideal for use when building projects for the kitchen or outdoor woodworking projects. According to the manufacturer, it even works with radio-frequency gluing systems. To begin the application, clean the two mating surfaces to be joined. The boards should be dry, cleanly and evenly cut and free of any sawdust. Excessive sawdust can interfere with the effectiveness of the glue in the joint, so follow these sawdust removal tips to prepare the joint. Using a dry fitting of the joint before proceeding with the glue is advisable, to ensure that the two mating surfaces of the joint will match up cleanly and evenly. 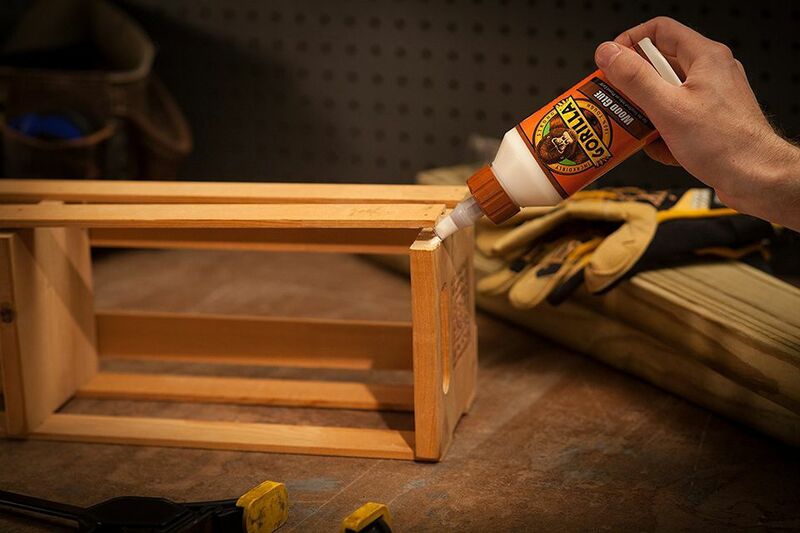 When applying Gorilla Wood Glue to your wood joint, the amount of glue is paramount to the quality of the joint. Too little glue will prevent a strong bond between the two boards, whereas too much glue will squeeze out of the joint, causing other problems. A good rule of thumb is to squeeze out a flat bead of glue (using the wide pop-top cap on the glue bottle) evenly along the entire length of the joint, then even out the glue using a small glue brush. The result should be thin but even covering of glue along the edge of the board. After aligning the two boards, use a few woodworking clamps to hold the two boards in place, applying just enough pressure to the joint to allow an even mating of the two mating surfaces of the boards but not so much pressure that the glue squeezes out of the joint. One of the major advantages of Gorilla Wood Glue over other similar white wood glue formulations is that the manufacturer advises just a 20 minute clamp time is all that is required on the joint. Most manufacturers suggest at least a 30 minute clamp time. While this ten-minute difference may not be a big concern on some projects, there may be times where that additional ten minutes will allow the clamps to be utilized on other joints. While the glue joint only needs 20 minutes of clamping, the manufacturer advises that the glue will cure in 24 hours. Non-toxic Gorilla Wood Glue cleans up with water. When your woodworking project calls for a stained finish, it is strongly advisable to remove any glue run-out to keep from affecting the stained finish. Because dried glue clogs the pores of the wood, stain will not penetrate areas of wood that have dried glue filling the pores, and the applied stain will not cover evenly the glued areas evenly. Frankly, glue run-out on a stained project is a bit of an eyesore, so avoiding glue run-out is important. Should glue squeeze out of the joint, immediately clean the area with the squeezed-out glue with a damp cotton cloth. Be thorough in cleaning the extra glue, as the glue will fill tiny pores that are not easily visible, and the remnants of the squeeze-out will show up in the finishing stages of the project. Using a pre-stain conditioner can sometimes help even out the effects of a dried glue run-out, but even the best pre-stain conditioner won't completely solve the problem. If you intend to paint your woodworking project, glue run-out isn't quite the problem that it is with staining the project. If you have a bead of glue that runs-out of the joint, you can let it dry and then scrape the excess glue off of the wood much like one would do when fixing a paint drip. A quick sanding of the scraped glue on the edge of the joint before finishing will mask the run-out effectively.